Our Norfolk wedding marquee hire service can help make your wedding one that you and your guests will remember. Having a marquee wedding is your opportunity to have a bespoke venue in the location of your choice! 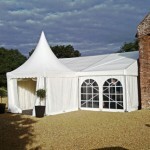 Our stunning marquees can be installed in almost any location and can be customised to create the perfect wedding day! Do you have a vision of your perfect day? 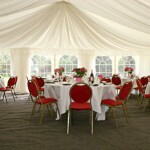 With a marquee wedding, you literally start with a blank canvas to help make your vision a reality. At Grice Foster we have a variety of marquees for hire to suit a range of venues, we can tailor a marquee or venue package to include linings, lighting, heating, flooring and dance floors. Not sure what you want yet? Our experienced team can help inspire you by offering advice on layouts, planning, lighting and delivery arrangements. Sometimes you find THE venue where you want to get married, but then you find out there's not enough room for all of your guests. 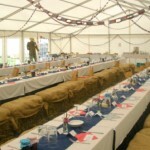 Having a marquee as a venue extension can be a great way to expand your venue to accommodate those extra guests! It's your special day! We understand the importance of getting every detail right, there are no second chances. That's why as part of our Norfolk Wedding Marquee hire service we offer a free site visit, friendly helpful advice and a no obligation quotation. We want to listen to your requirements first hand and discuss how we can help contribute towards making your wedding that extra bit special. So if you and your significant other are thinking about having a marquee wedding, get in touch and let us help you start planning the perfect wedding day!